Unimat Recycled Rubber Parking blocks are made from very durable material, we as manufacture make sure the fabrication process has top quality control check and standards. Our recycled rubber parking blocks are satisfaction guarantee, we also offer the lowest prices in the market, with Unimat products you will have durability and will pay a low cost. Unimat recycled rubber parking blocks are sturdy and very durable, they are also very easily to be carried and installed. Its weight is very light just a little be over 30 pounds. Recycled Rubber parking blocks are the best option for your parking establishment, residential building or company. Recycled rubber parking blocks have many benefits such as the ones listed below. Remember you offer top quality at the lowest prices. Quick installation, rebar spikes sold separately. Our Best Value in a Rubber Parking Block the Economy Rubber Parking Block. Weighing 26 lbs each they are sturdy and durable but easily carried and installed by one person. These Economy Rubber Wheel Stops are made from Durable Masticated Rubber Compound consisting of approximately 65% pre-consumer recycled rubber and 35% post-consumer recycled rubber. This parking block will flex slightly to lie flat on uneven or cracked surfaces. Economy Rubber Parking Blocks have 4 counter-sunk mounting holes per block and all installation hardware is included. 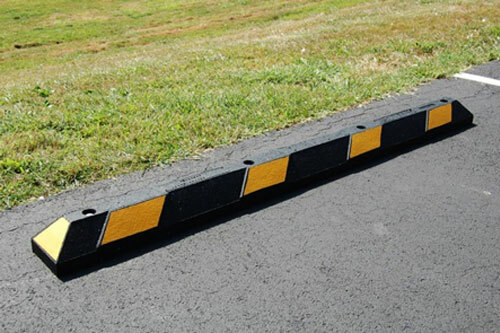 Recycled Rubber Parking Blocks feature molded reflective tape for high visibility and safety. 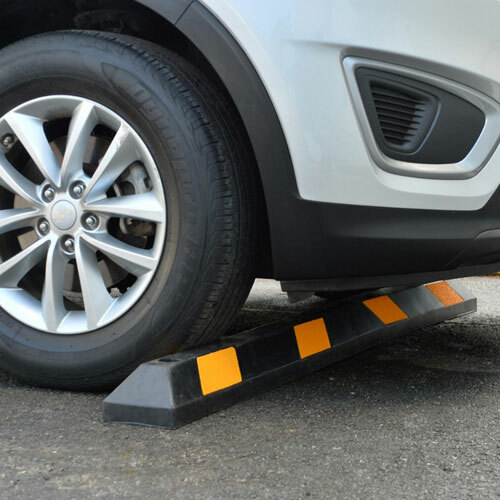 Recycled Rubber Parking blocks are made with corrosion resistant recycled rubber for long lasting durability, they are easy to install, and we offer top warranty = 5 Years. Give us a call right away and we will be more than happy to assist you with your request, we can ship right away, our products are in stock ready to go!